I really agonized about giving this book such a low rating. I wavered between 1 and 2 before ultimately deciding that, for me, there were no redeeming qualities to warrant the extra point. The Brief Wondrous Life of Oscar Wao started off as a short story before the author decided to turn it into a full length novel that clocks in at 339 pages. It was 339 pages too long. My issues with this book are numerous. One is the use of endnotes. Some were necessary, but many were not, and having to flip back and forth between the note and the page I was reading was extremely frustrating. I can’t say that it would have been any less frustrating if they were footnotes — a quick glance down the page and everything makes sense — but what I don’t understand is why the author, who had no problem with excessive descriptions couldn’t just explain whatever he noted within the text itself. Having to constantly stop, go find out what that little star was telling me I needed to know, and then keep reading ruined the flow of the novel. Sure, I could have not read the endnotes, but then I would have been confused which, for me, means the author failed. A little bit of ambiguity is fine, but when your reader is completely lost, you haven’t done your job. Thank you, Mr. Diaz, I appreciate the lesson in Dominican history, but if that was what you wanted to write about, then you should have written a textbook. My next issue is the constant change in narration. Some chapters are in the first person, some are told by a third person whose identity isn’t revealed until halfway through the novel. Not only was the change from telling Oscar’s story, to his sister’s, to his mother’s, to his grandfather’s, to everybody else and their mother, but the voice was inconsistent. And even within the same chapter or part, it was very choppy. At some points, it’s rather academic — which is usually when all those endnotes start popping up — and at others, it reads like one homeboy talking to another, which brings me to my next issue. The language. I have no problem with profanities or lewd conversation in a novel, but I could have down without about 99.9% of those two things in Oscar Wao. In some places, the language made sense — in the dialogue, it felt authentic — but when the author is saying to the reader, “N*gger please,” well, that’s just unnecessary. My other language problem is the Spanish. I’m not saying there shouldn’t have been any Spanish — the novel is, after all, about a Dominican “ghettonerd” — but the lack of translation, much like the endnotes, constantly forced me to stop, go look up what a word meant, and go back to reading. Please keep in mind that I took Spanish for five years and have several Hispanic friends and a Puerto Rican boyfriend, with whom I speak Spanish occasionally. I have a decent Spanish vocabulary for a non-native speaker. I know that every Latin American country has its own dialect so I wasn’t expecting to know every single Spanish word in the book. That would be arrogant of me. But I was expecting to be able to at least have an idea of what the word meant in context which I didn’t in many places. The premise, this concept of fukú, had potential, but Diaz missed the mark. Crazy love is Oscar’s family’s curse, but Oscar wasn’t cursed — he was pathetic. I know that there are people out there who go from crush to crush to crush, but eventually you grow out of it. Oscar never did. To that I say: The definition of insanity is doing the same thing over and over again and expecting different results. Once it became clear that his usual approach, or lack thereof, wasn’t working, you would think Oscar would try something else. He doesn’t. Oh, he tries to lose weight once, but gives it up after a couple of days. Does he ever try to stop talking like a Tolkien character? No. Does he ever try to approach a female with the understanding that maybe, just maybe, she isn’t into Dungeons and Dragons? No. Maybe that’s why he could never get a girl. That’s just my theory, of course. My last issue, at least for the purposes of keeping this review from turning into a dissertation, is the ending. Oscar dies, obviously. Once he did, I was expecting the book to be over, with maybe a prologue. No. The narrator — who we find out is Oscar’s sister Lola’s boyfriend, Yunior — teases the reader with section titles “The End of the Story,” “On a Super Final Note,” “As For Us,” “As For Me,” muses about Lola’s daughter showing up at his house and then finally ends with his receiving a package Oscar had sent from Santo Domingo with a manuscript and a letter to Lola. To put this all in perspective, Oscar dies at location 3820 of 4301 (no page numbers, one of the downsides to this particular format), but Yunior doesn’t officially end the story until location 3994, about 12 pages later. Maybe a more appropriate title would have been The Neverending Story of the Brief Terrible Life of Oscar Wao. 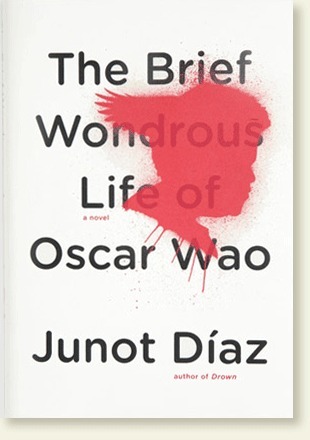 Tagged dominican american, junot diaz, pulitzer prize, the brief wondrous life of oscar wao. Glad I found your blog– been loving reading your book reviews.